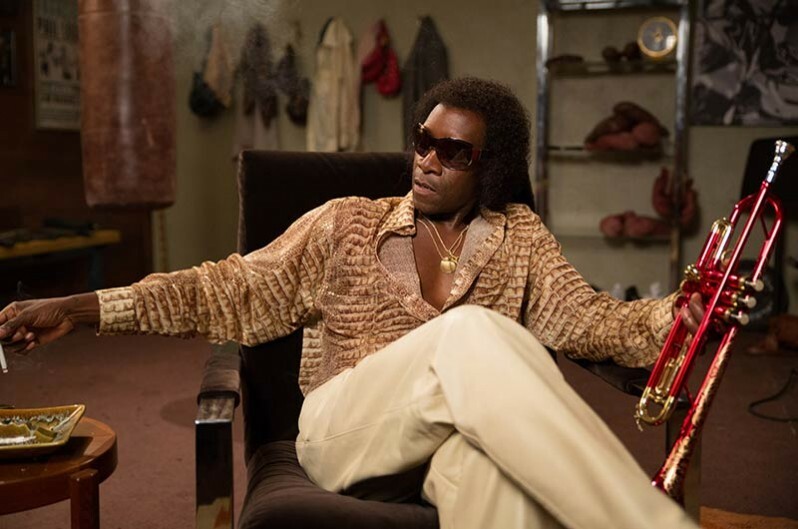 In a five-year funk after driving away his wife/muse by drug-fueled paranoia and physical abuse, the innovative Miles Davis [Don Cheadle] has hit a murky low. Photo by Brian Douglas ©2015 Sony Pictures Classics. All rights reserved. This set is meant to transcend time, and it does. Note the re-decorating elements on the right! 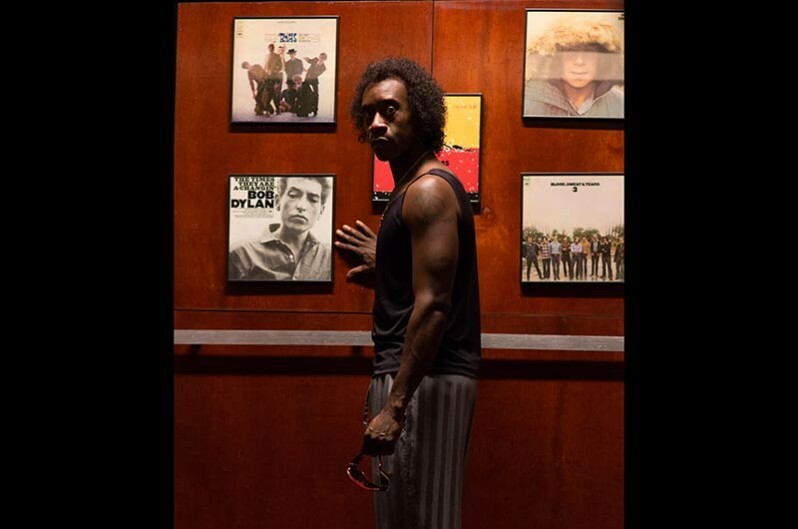 Miles Davis [Don Cheadle] in his basement den and studio. Also pictured, Keith Stanfield. 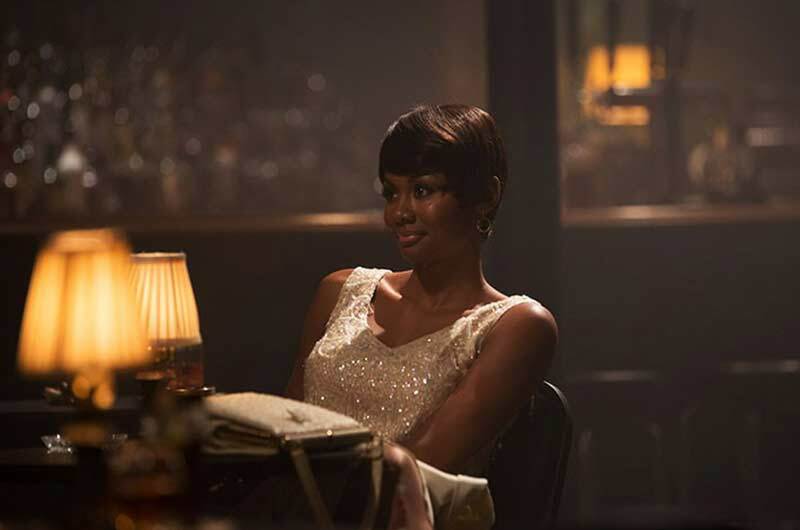 Photo ©2015 Sony Pictures Classics. All rights reserved. Photo ©2015 Sony Pictures Classics. All rights reserved. “To attempt to DO Miles Davis rather than simply chronicle the highlights and lowlights of his life. That process felt like Miles to me." 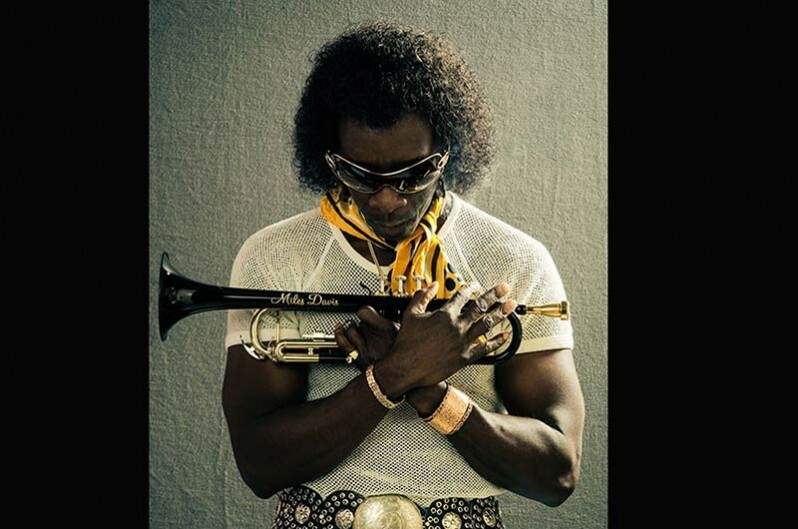 MILES AHEAD is an impressionistic, conceptual work, mirroring aspects of the mesmerizingly talented Miles Davis: stretches of deep creativity and innovation, a fallow period, symbolic moments from early days, flashbacks, hallucinations and fantasies…and always attitude. The film is a kaleidoscope that comes into focus on three periods of his life, while slipping in and out of allegory and illusion. 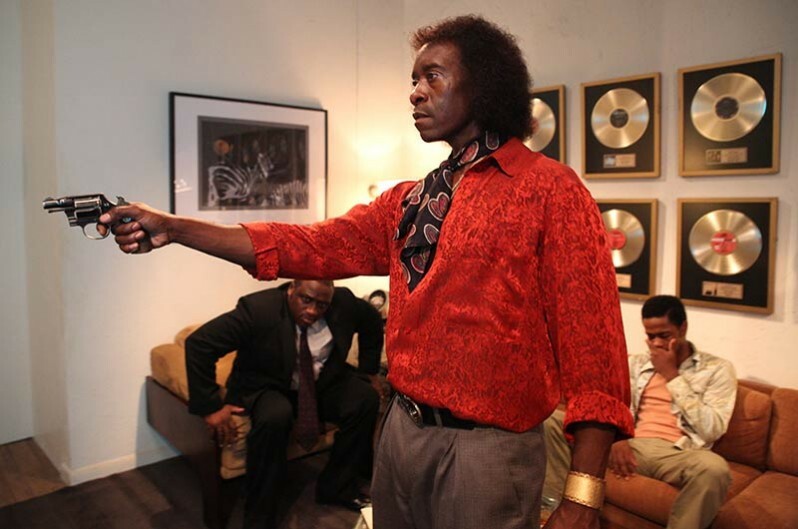 In order to fulfill this vision, first-time Director Don Cheadle, who stars as well, wisely relied on other deeply committed and talented professionals, particularly Director of Photography Roberto Schaefer, Production Designer Hannah Beachler, Set Decorator Helen Britten SDSA and Costume Designer Gersha Phillips. 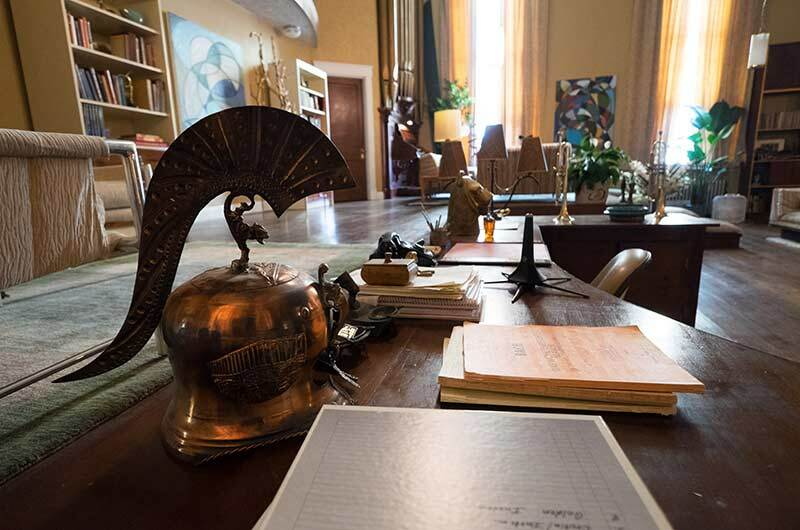 SET DECOR: The film is an abstract form of a personal history, so how important was it to re-create from your research his actual home, or specific elements of it? 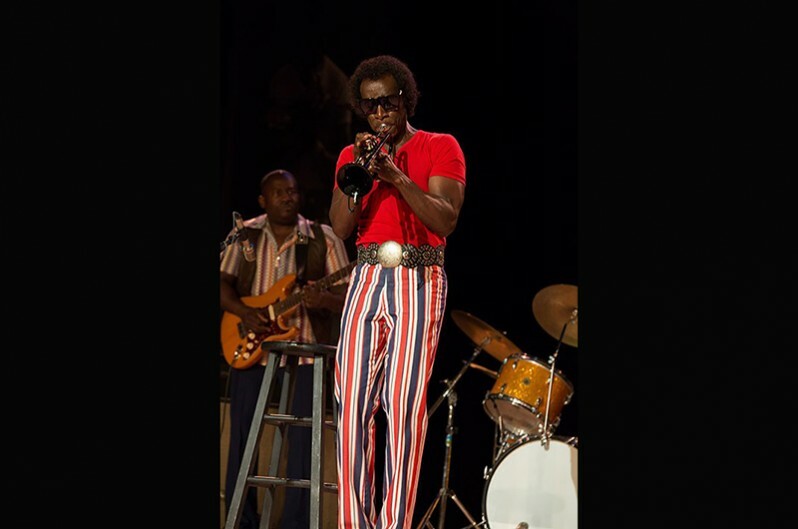 Set Decorator Helen Britten SDSA: Miles Davis had excellent taste and style. It was important to respect that. We researched his décor and tried to remain true to that, adding twists to accommodate Don Hannah’s vision. 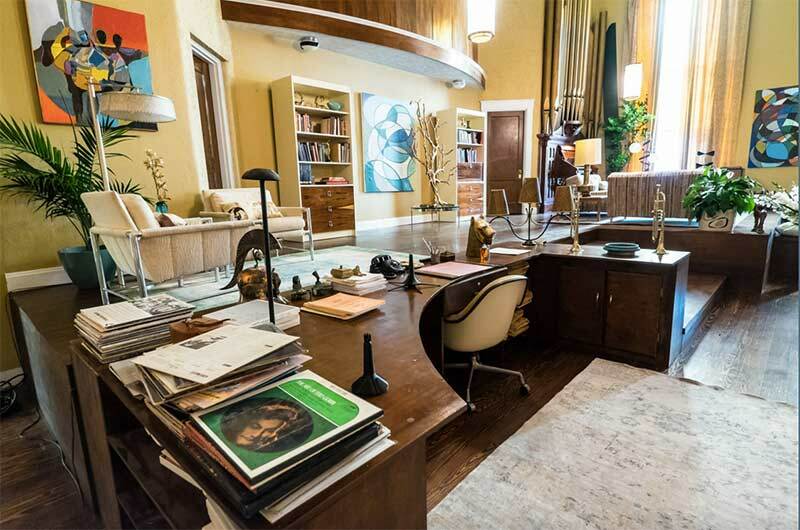 We did research his actual home but we did not have to copy it, although we were fortunate to find some exact replicas, such as his coffee table and some phones that he had. 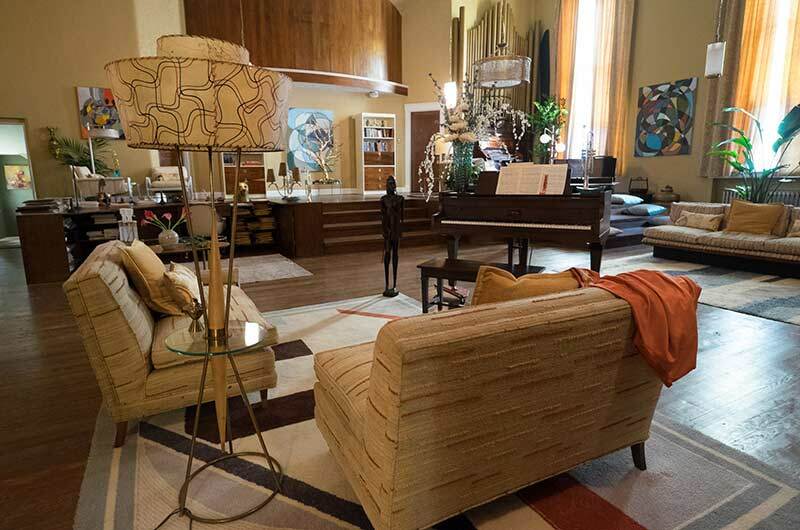 The phones were definitely part of the décor—he had eclectic taste when it came to those phones! I spoke with Frances Davis [his former wife and muse], and she sent me family photos that we duplicated and used on the set. It was great to have that authenticity. 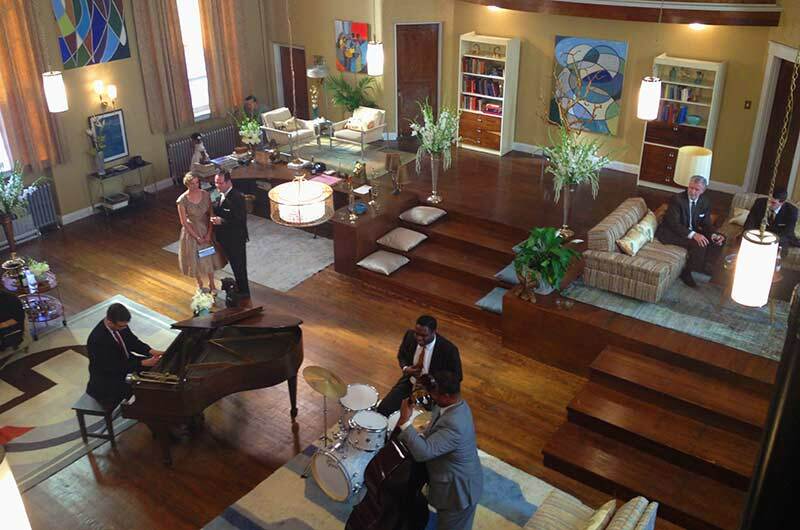 Miles’s family was extremely helpful in allowing us to use his artwork, which we duplicated and used on set. Britten: Yes, all of the artwork was inspired by Miles’s style. We keyed off his music and his style. In the film’s credits, you will see thanks to many of the artists that we used. Set Decorating Buyer Andrea Doyle worked also on the weekends to paint the art-in-progress piece that Miles was painting of a bullfighter. This is the art that was featured on the easel in his home. Don was very particular about this. We gave him choices, and he chose Andrea’s. We had the help of many artists and photographers. Along with the art for Miles through the different periods, there were scenes where we had to have walls full of representations of famous musicians. Robert Hofbauer, owner of the furniture store Left Coast Modern, really helped me out with original painting originals that were true to the era. Michael Solway and the staff of Solway Gallery also went out of their way to help me get the right pieces for Miles. They knew of artist Mark Norris, whom they thought would be ideal, as he had abstracts that featured our color palettes for both the ‘50s and ‘70s. We also used Cincinnati artist Charles Ross for Miles’s home in the 1970s. He painted abstracts with earth tones that worked seamlessly with our dark period on the set. And Mark Fisk, owner of Mainly Art, had a plentiful collection of period-perfect furnishings and art which we were able to use for the different time frames. 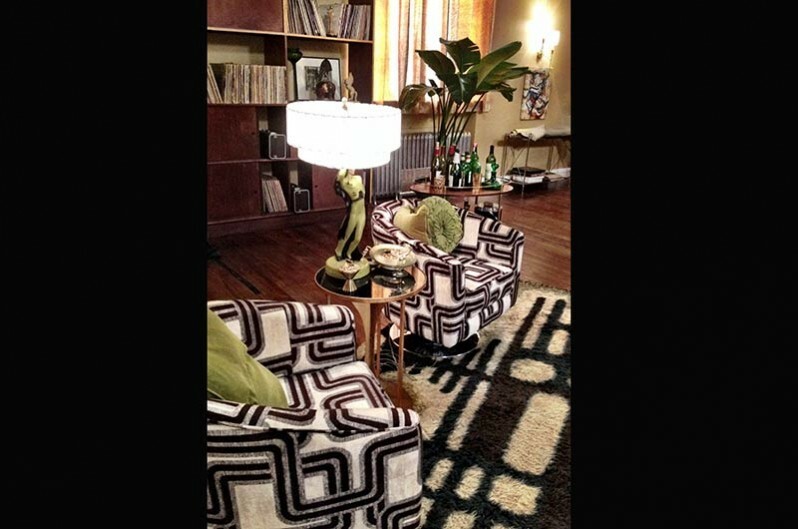 SET DECOR: Did Cheadle have a certain look or specific pieces or that he wanted included? Britten: He wanted to make sure that we had Miles’s style—nothing tacky should distract from Miles’s style. Also, Frances was a decorator. 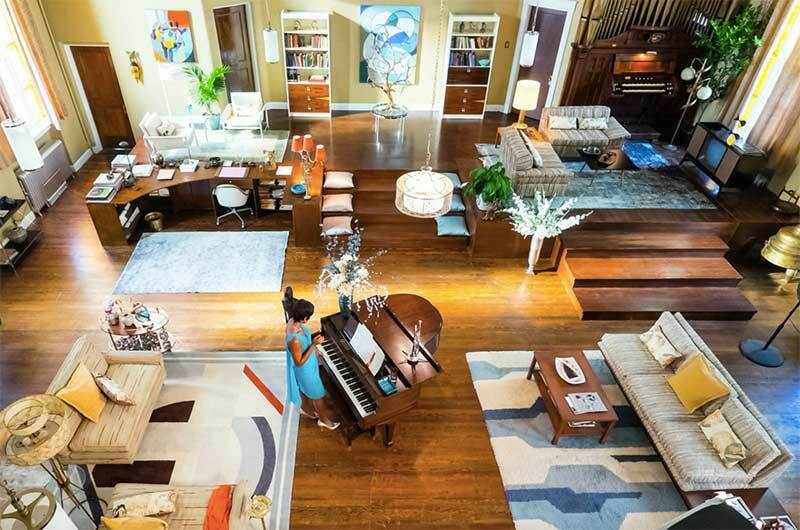 There is even a scene where she has paint swatches and fabric samples she is looking at right before they have their big fight in the living room. Don cared very much about the overall look of the show and Hannah was excellent at keeping us all on track with the changes we had to make in décor to keep up with the various moods of the picture. We had many meetings where we collaborated and discussed the mood boards and what we would actually use on set. Britten: Yes, the album Sketches of Spain, in particular, and all of Miles’s music was key in inspiring us in the décor. We mixed his memories together. There is no singular line in this. It is a spiral memory and goes back and forth as memories do. You can tell by the music when Frances is going to be coming into a scene whether it is a memory from his past or a hallucination. How did the sets reflect this? Britten: We had many changeovers in the house for three different time periods. Miles had expensive taste and it was reflected in the house no matter what the era. 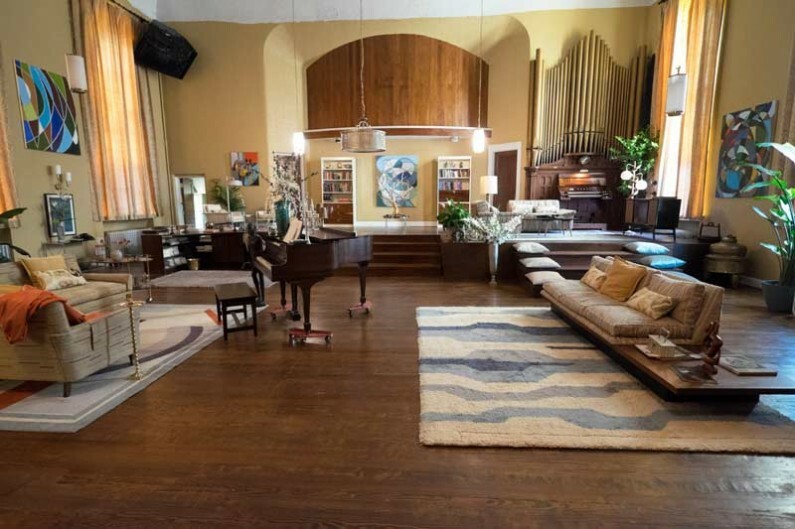 Their house had been a church and they transformed it to be their home. We had to have a flow chart to keep up with the shooting schedule and the changeovers day-to-day and hour-to-hour. We were lucky in that Cincinnati, where we filmed, has a great vintage fabric store and wonderful art galleries. Several stores carried furniture and beautiful lighting from the eras we were shooting. The color palette for the 1957 scenes was very vibrant to keep up with the romance between Frances and Miles. As their relationship disintegrates, the colors move to darker moodier hues. When he is on his own and she no longer lives in the house, it becomes cave-like, curtains closed and dark colors, an indrawn mood. We filmed the 1950s not only in vibrant blues and pastels, but also with live flowers and living things. For the 1960s transition time when we had green tones, light is starting to go out and we start minimizing the life in the house, no flowers and just a few plants. We wanted a chaotic feel for his life in the ‘70s, Miles’s lost years. We went to dark, shadowy earth tones and all life removed, no live plants, no flowers. We also brought in a sunken sofa. He is really withdrawing into his inner space during this time period. The bedroom also changed a lot. The bed was plush blue during the 1950s to reflect the plush sexiness of their life. With the 1960s gold metal headboard, Frances is boxed in. For the 1970s, it’s a big king size bed with shelves…Miles lives alone. 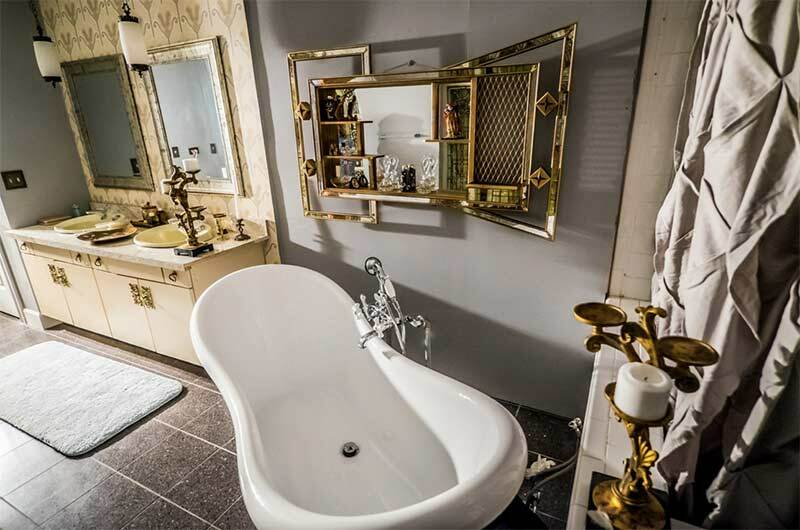 The bathroom even had a major changeover. One wall went from having a beautiful period mirror to having the whole wall with speckled veined mirror tiles. The artwork and lighting were key elements, almost characters in the film. We changed out the artwork to reflect the mood of the music and the romance. Hannah included me in wardrobe meetings with Don and Gersha Phillips, who did such a phenomenal job with the wardrobe, so I was able to find artwork that would complement the actors and their scenes. The vivacious colors of Frances’s wardrobe were reflected on the walls. When she is in the house, it is neat and tidy and full of life. Her imprint was on the house. When she leaves, it goes dark—you keenly feel her absence. The Light goes out. Britten: His music collection expanded. 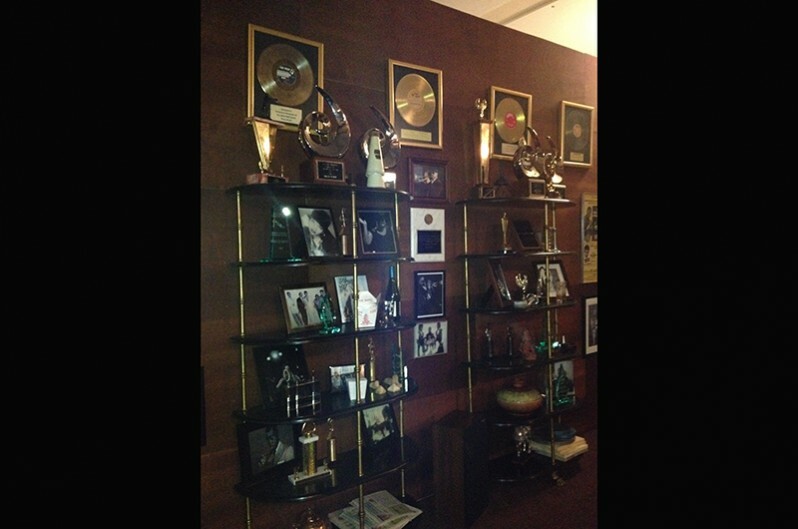 He kept it all. 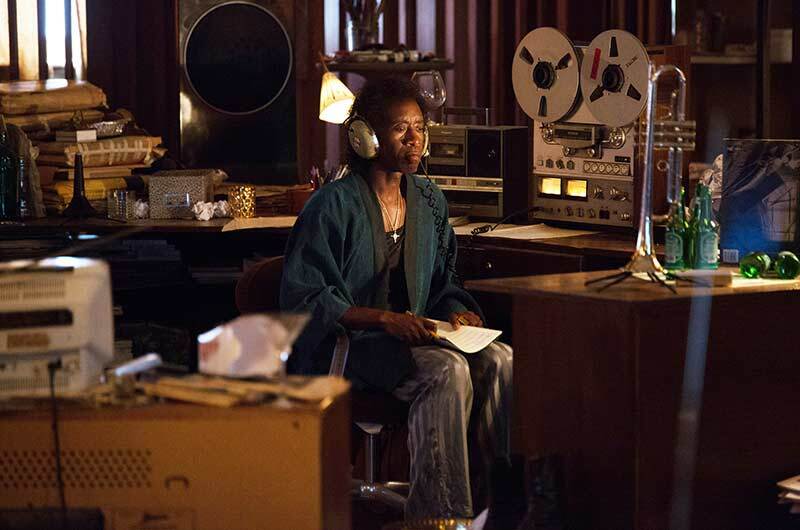 Anything music-related stayed, we just upgraded his stereo system and his televisions. Electronics tell time change very quickly. 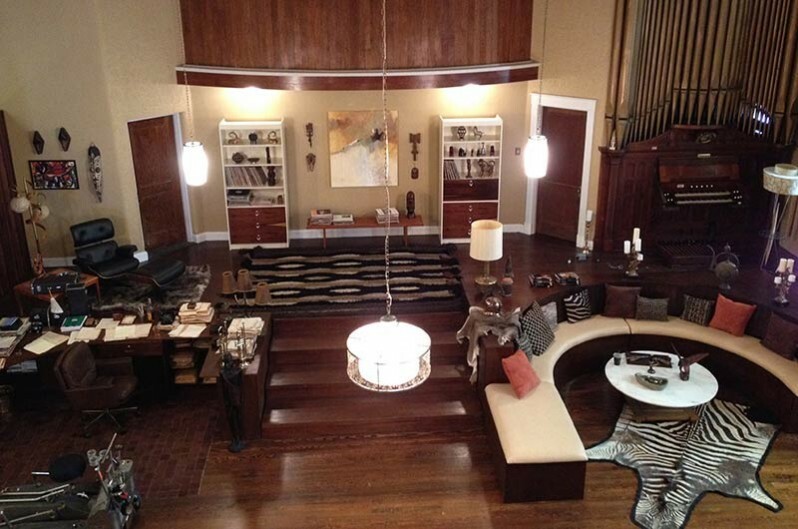 The windows in the living room were so huge because the house used to be a church. We didn’t have the budget or the time to change them completely, so we chose a fabric that we could reverse and just turn around to make the room appear darker. In the bedroom, we changed everything. As I mentioned earlier, we had three different beds and all the bedding changed as well, and then curtains and artwork had to be changed over. We would switch the glassware on the open shelving in the kitchen to reflect color: bright blues for ‘50s, green for ‘60s and amber for ‘70s. You could feel his world closing in as he became secluded and more into his own head. Britten: The sets reflected his chaos, especially his desk area in the living room and his recording studio in the basement. That is where he kept his punching bag. He also was restless in his painting. The painting area was right above his desk in the living room. He was always listening to music or watching TV while he did other things. He had phones and TVs everywhere. Trumpets, telephones and televisions were always within arm's reach. He had piles of newspapers mixed in with his collection of artifacts from around the world. The kitchen was messy too. He would cook and not clean up. More newspapers, take out food, trumpets and albums scattered everywhere. If something broke, it just sat there. Were there clues in the sets that revealed aspects of this? Britten: The upscale office for Columbia Records George Butler with all of the gold albums and sense of order was to be a contrast to smarmy independent agent Harper Hamilton’s office, so we used the same painting but with reverse colors. Harper’s office is not as controlled and has an aspect of someone wanting to be more than he is. Here is a man who wants a piece of Junior the same way George Butler wants to have a piece of Miles Davis, but it’s high dollar environment versus low dollar. Still, they had to have the same vibe, thus the desks being similar, but one much better than the other. 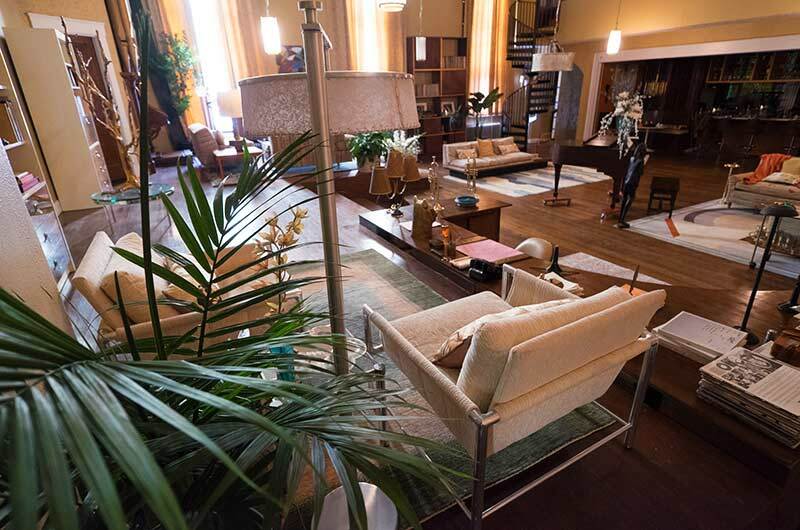 Junior’s apartment set is a stark contrast to the opulence of Miles’s home but it still has the same color elements of Miles’s in the ‘70s. There were curtains from the house that I used for Junior’s place. Junior is all about the music, as was Miles. He has all of the elements that Miles has, just on a lesser scale. 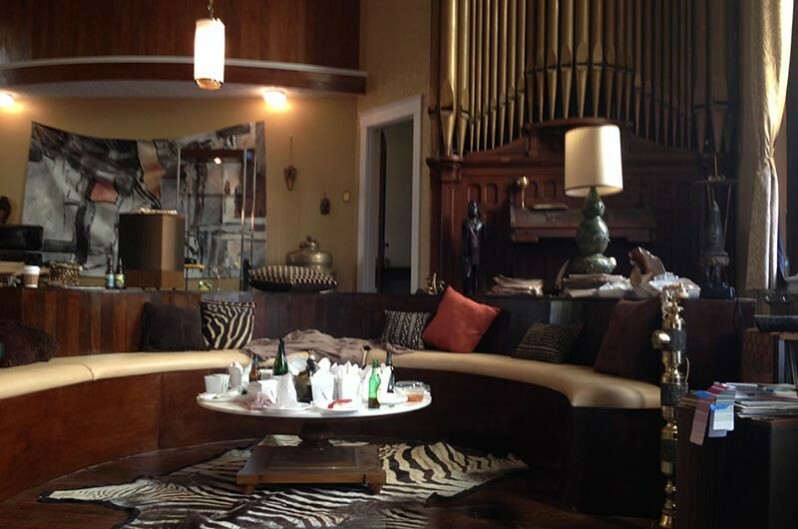 The framing of the shot with Junior in his apartment has a gold tree hanging on the wall and a leopard rug in the background. 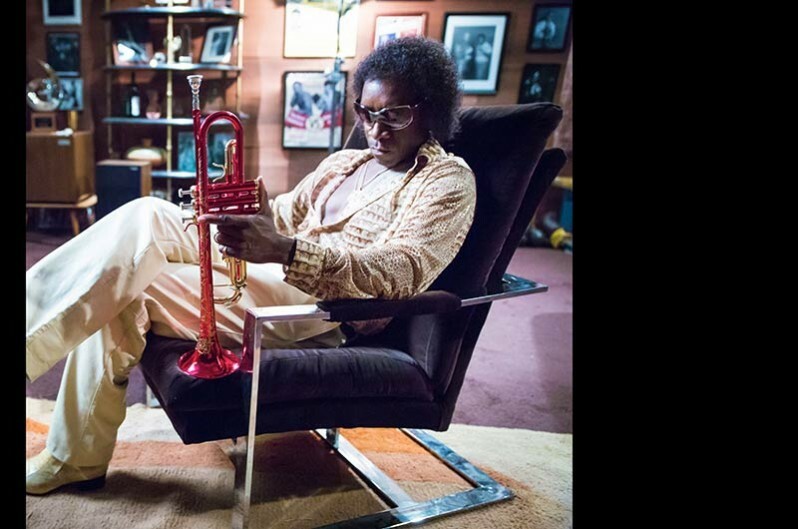 Miles has a gold tree in his home as décor and many animal prints later in life. Junior has the same likes just not the money. 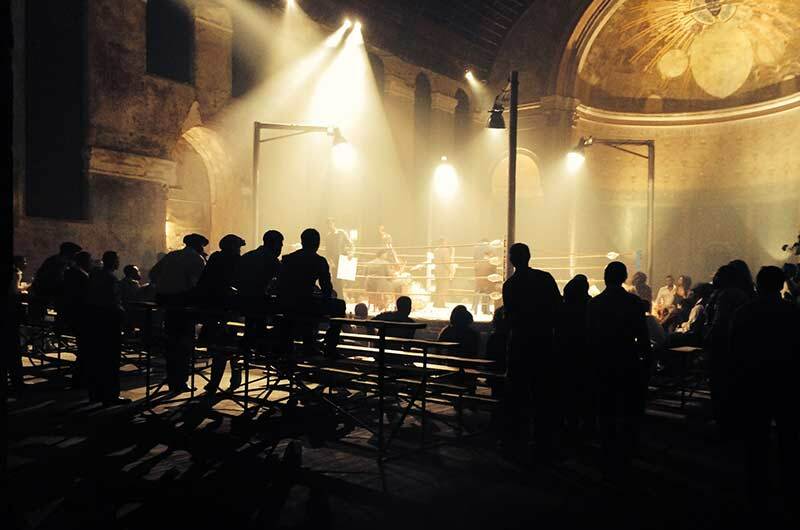 SET DECOR: And the boxing venue? Britten: This was a great location. My Leadman Mark Woods did a phenomenal job getting the boxing ring and the set done just right. Hannah designed some great boxing posters as well. The beauty is in the simplicity. The scene where the musicians are playing in the ring and Miles is running by and hallucinating that he sees Frances is one of my favorites. Britten: Miles plays up on the stage with a room lined in red velvet curtains, as Frances sits at a table dimly lit. It has to feel like they are the only two people that exist and that they have a deep connection. I think the intimacy was achieved by lining the room with the curtains. Our research showed this was the look the Vanguard had, so you can’t improve on what has been done right before. Britten: We did have to get it right, all of us. Not just in front of the camera, but behind as well. 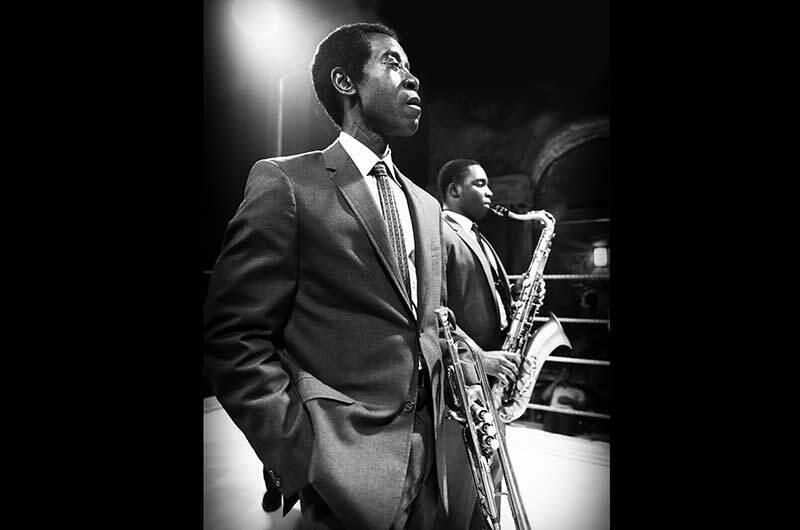 We were trying to do justice to Miles Davis and do something that had integrity even though we had to do it in a limited time frame. SET DECOR: And in a city that is nascent in film production! 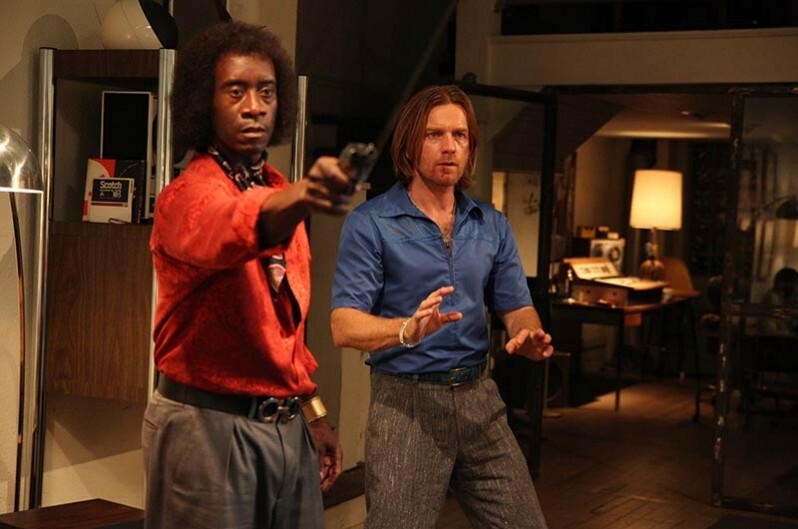 Cheadle points out that only three features have ever been shot in Cincinnati! Britten: Cincinnati is a great city to be in. The architecture is amazing. The people are great and the vendors were wonderful. I think they still are working on building up their infrastructure crew base so that they can have enough qualified locals to accommodate productions coming in. I would like to mention the superb job Leadman Mark Woods and our team did creating all the grungy alleyways that give the gritty mood of the dark backdrop for Miles’s life as he struggles with his music and his drug addiction. 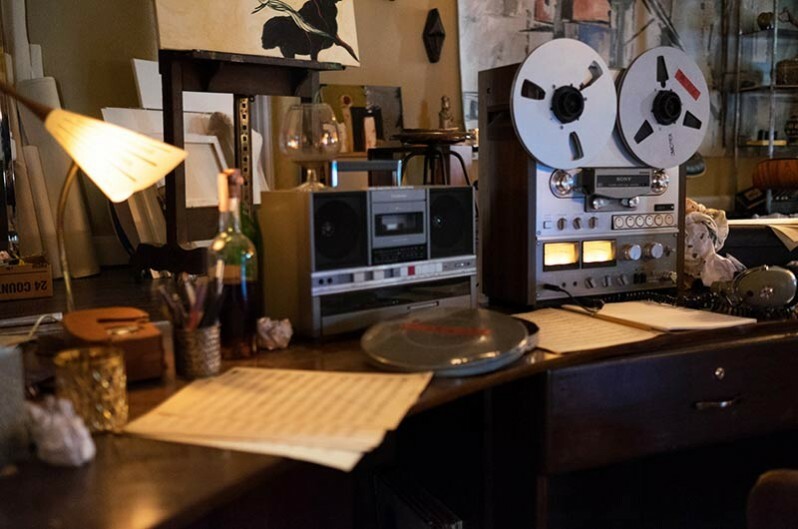 Kudos also to Art Department Coordinator Jen McClaren and On Set Dresser Amy Cluxton, amongst the talented locals we worked with on this passion project. Sarah Young, my Assistant Set Decorator, was instrumental in helping source local vendors. She always found the perfect item to sell the era and immerse us into the mood of the set. And Hannah was a fantastic Production Designer, keeping it very cohesive between all of us. 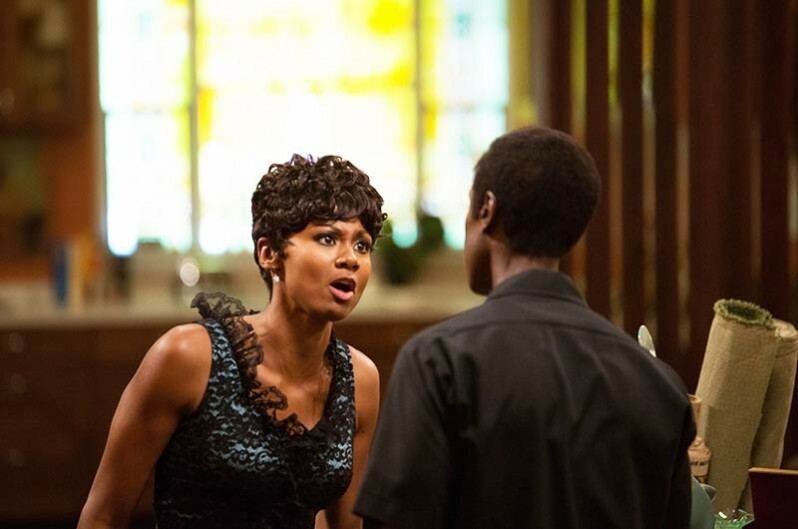 The music, the look, the wardrobe…she never missed a beat. The whole film was an intense collaboration, and we’re all proud to have been a part of it.